(1 Customer Reviews) | Write Review 12 issues per year Utopia Kitchen & Bathroom is a monthly periodical magazine showcasing inspirational kitchens and bathrooms to homeowners. Utopia contains highly informative, expert content on the latest styles, designs and trends; showcasing stunning photography, stylish interiors and iconic designs. 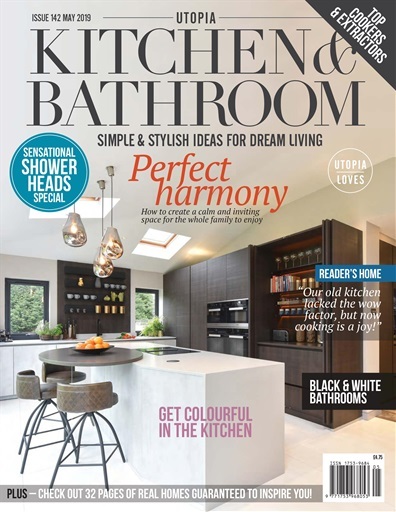 Each issue contains the latest kitchen and bathroom products, exclusive real homes, interviews, expert tips and tricks, a huge competition, exclusive designer collections and much, much more. Whether your kitchen or bathroom project is large or small Utopia will offer the inspiration you need. This issue, Utopia is unleashing colour in the kitchen to celebrate the multi-hued joys of spring. Get the tips and tricks from some of the design leaders, including a Colour Consultant, in Throwing Shade (p38). Monochrome bathroom schemes are hard to get wrong, but Utopia have an abundance of inspirational ideas on how you can take this classic look to the next level, Darkness & Light (p68). Is your shower head not doing it for you anymore? See this round up of the best showerheads that are guaranteed to stimulate and invigorate, Focus on… Sleek and Stylish Showerheads (p56). Last but not least, get to know the award-winning interior designer, Chantel Elshout (p86). Speaking to Utopia, she revealed her inspirations behind kitchen design, as well as how she went about creating her own kitchen. 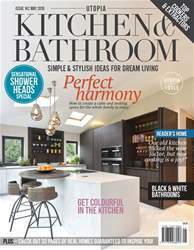 Utopia Kitchen & Bathroom is a monthly periodical magazine showcasing inspirational kitchens and bathrooms to homeowners. You'll receive 12 issues during a 1 year Utopia Kitchen & Bathroom magazine subscription. You'll receive 12 issues during a 1 year Utopia Kitchen & Bathroom magazine print subscription.